School is a wonderful place to begin teaching kids about how they can use their time, resources, skills, and community to help others. I love it when teachers take the initiative to arrange service projects and integrate it into something the class is learning about, but sometimes they simply don’t have the time. We are lucky that my son’s school is very interested in supporting the community and raising awareness about special projects, and is open to families getting involved too. 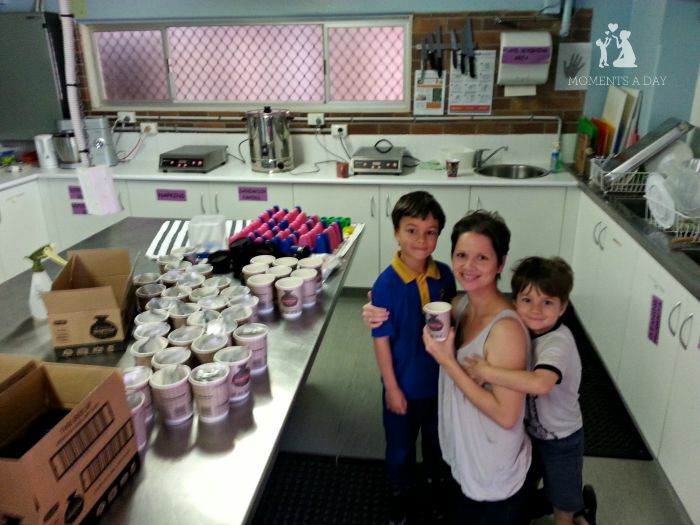 When my son started school I decided that as a family we would aim to organise a fundraiser or service project there each year. Last year we collected board books for a preschool in Papua New Guinea, which you can read about here. Over the last few weeks, we have been busy organising another service project for the same preschool which is now in need of school supplies. I was delighted that All Natural Soup offered to donate 100 cups of soup so we could raise money. All Natural Soup offers a great range of soup flavours in several different styles. We chose cups of wonton soup for our lunch time fundraiser which were very simple to prepare – just pour the contents from the sachet, then mix with boiling water! With no added colours or preservatives it was an healthy plus tasty option… and the kids (and staff) loved it. 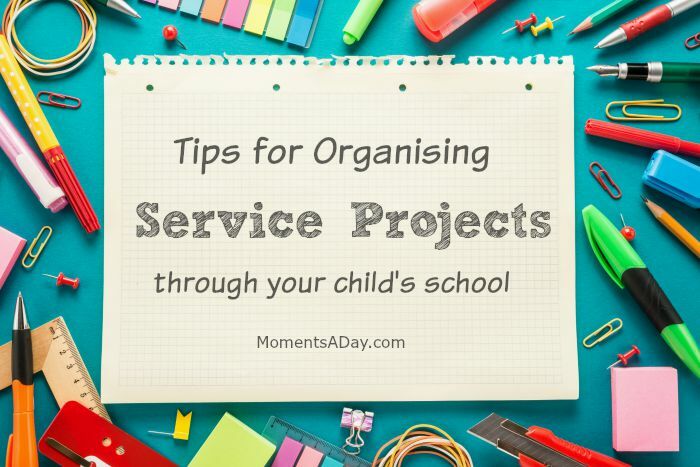 Here are some tips for organising service projects at your child’s school, based on my recent experience with our soup fundraiser. First things first – it is a good idea to approach your school’s principal to ask if the school would like to be involved in a service project or fundraiser. You could go in with a specific idea or ask if there is a particular way you can help. You never know if there is already a project in the works that you can collaborate on, or there is another parent who tried a similar idea the year before which you could build on. For a list suggestions, check out these 10 easy school service project ideas. The principal can let you know what the regular process for service projects might be. In our case, I had a specific idea to work towards since there was a certain overseas preschool I wanted to fundraise for and I already have an offer from a company for goods we could sell. The principal just suggested the day and the process. We advertised in the school newsletter and handed out small informational forms to all the students which could be returned with money during the week before the fundraiser. The office staff collected the forms and money, made all the lists, and I took care of getting the soup and distributing it to the kids on the day. My next tip is to give yourself plenty of time. This means setting a date well before the service project is meant to take place, to ensure you are not stressed getting everything ready. And also scheduling in lots of extra time on the day so no one has to rush. Allowing yourself to work slowly and steadily will probably mean you have a more enjoyable experience, so if anything comes up that you didn’t expect you have time to address it without too much worry. As for setting aside extra time on the day of the event itself, this is because kids want to help out but this often means they will do things at a slower pace than you could on your own. They may just want to carry in all the boxes of soup by themselves (like my kids are doing above). As long as you have plenty of time, you can let them be as involved as they wish! My third tip is to add an educational aspect to the fundraiser. After all, school is the perfect place for kids to expand on their knowledge and experience. 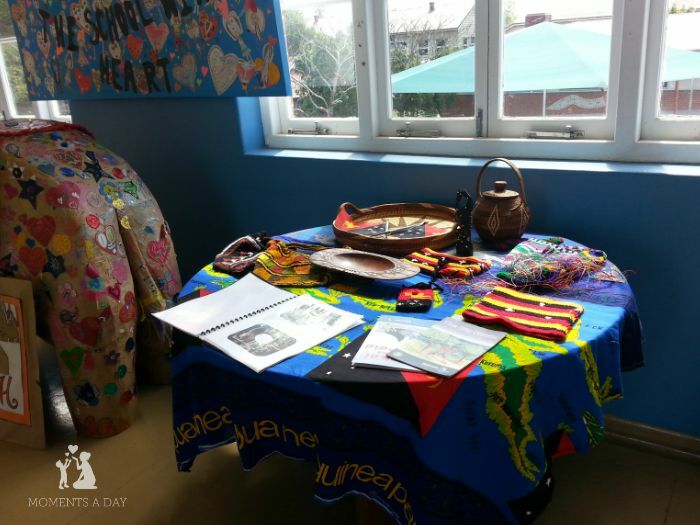 In our case, I put together a selection of crafts, storybooks and photos from Papua New Guinea which we displayed at the front entrance of the school – so the kids could learn a bit about the country. I also included a description as well as pictures of the preschool we were fundraising for. Regardless of what type of fundraiser or service project you might organise, there will be many ways to integrate learning into the experience… whether that is through stories, guest speakers, field trips, research projects, hallway displays, or any other avenue. Your child’s teacher might have ideas for making the project relevant to the class materials as well. My final tip is to ensure the project is meaningful to your kids so they are really excited to be involved. Doing something for the preschool in Papua New Guinea was a natural choice for our family as my sons remembered visiting it a couple years ago, and they constantly hear about its needs and progress as it was started by their grandparents. If we didn’t already have that connection, I would have tried to find another organisation or cause that was relevant to their lives. Our family has thoroughly enjoyed being involved in the school in this way, and I hope that by including my kids in service projects such as these they will be continue to build on the habit of being kind to others. There is so much potential for the school community to be utilised for good… we are only limited by our imagination. 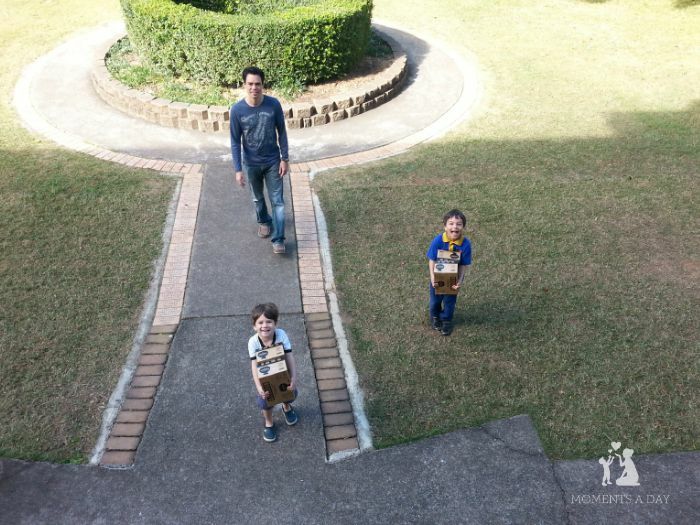 Have you organised a service project at your child’s school before? What advice would you share with others? If you are looking for more ways to integrate kindness into your family life, check out this page full of stories and ideas. 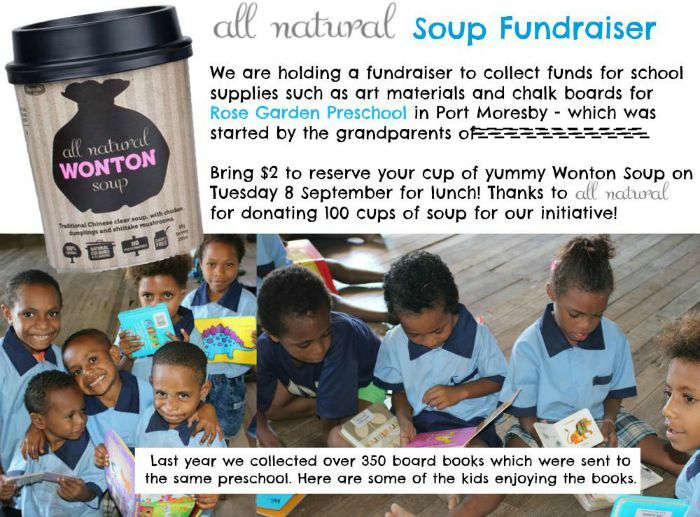 Thanks again to All Natural Soup for providing me with product for our fundraiser. You can stay up to date on their latest range on Facebook and Instagram. All opinions are my own. To read more about reviews on my website, visit this page. I love this so much! Great tips too. Oh that’s awesome Kate please let me know if you do something, I would love to hear about it! I have a series “Acts of Kindness by Real Families” which I would love to interview you for if you would like to share your story, too. Good luck! Great tips and I love your board book service project too. How do you manage fundraising fatigue in a school community? That is such a great question Kelly as there are definitely tons of fundraisers at our school so I know it must be overwhelming at times! I guess my thought is that not everyone gets involved in every fundraiser, so having a variety lets families choose what to support. Also the principal can probably see where there may be gaps – in types (i.e. gold coin donation or book drive) or times of the year – so hopefully not too many events overlap! Some great tips and such a meaningful project for you and the family. What a great effort! Well done and thanks for the tips.